Breeding chickens naturally is a good way to increase the numbers in your flock. However, some backyard farmers steer clear of this route for fear of ending up with multiple roosters. Still, for others, breeding chickens on their own is just part of the agrarian experience and one that is not so hard to do, especially if you have a broody hen. Some hens go broody without any help and choose to sit on the eggs all day. This can be brought on by instinct, hormonal changes, or the change of seasons. Encouraging this behavior will, eventually, lead to new baby chicks, but knowing what to do (and what not to do) with a broody hen is the secret to successful breeding. The broody trait is something that hens either have or they don't. If you are committed to raising chicks naturally, select a breed like Buff Orpingtons that have a high level of broodiness. Still, not every Buff Orpington will go broody, so you have to sit and wait until it's time (no pun intended). And when that day comes, your broody hen will sit, all day, in the nesting box in a trance-like state—she'll hiss, growl, and peck at you if you try to remove her. She'll only leave the eggs once a day to eat, poop, and drink. Mostly, she'll stay fluffed up and perched atop them. Now let's have a little talk about the birds and the bees. To breed chickens, you first need a rooster to get the job done, as an unfertilized egg will never hatch. One rooster per twenty hens should suffice in order to get plenty of fertilized eggs. This rooster, however, will not fertilize every hen's egg. Spy on your flock and look for a little mounting action. Then, you'll know chicks are in your future. Serious chicken farmers don't allow mix-breed hens to breed, as the results of the hatch can be very unpredictable and possibly unviable. You can, however, take two purebred chickens and allow them to breed. For best practices, start with a flock of one purebred variety and leave them to their own devices. For the time being, keep different breeds of chickens completely separate. Don't bother your broody hen. She needs to feel safe and protected in her box so she doesn't abandon her eggs and chicks. Leave the eggs be and place her food and water nearby (but not so close that she'll knock it into her eggs). Once the chicks arrive, the mother hen is the brooder lamp—she knows what to do. The baby chicks will regulate their own temperature by snuggling under her, on her, and in her wings, as needed. The family will take care of themselves as long as there is food and water nearby for both mama and babies. And If you do need to move mother or the babies, do it in the evening or at night when she is sleepy. With natural hatching, failure is to be expected. Not all clutches will hatch, and even when a broody hen goes the distance (sitting on the eggs for 21 days), not all eggs will turn into viable chicks. Expect some chicks to perish, both inside the egg and after hatching. And some eggs may never hatch. To inspect the process, gingerly remove any unhatched eggs four days after the first chick hatches, and then candle them to see what's inside. During the early weeks, feed both the mother hen and the chicks the same food (chick "starter"). It's next to impossible to separate their feed anyway, since they won't leave each other's side. You can even start to feed your broody hen chick starter. She won't need extra calcium when she's not laying eggs and the high protein will help her stay healthy during incubation. Depending on the flock's temperament, it may be best to separate the chicks from the rest of your flock. Most free-range flocks get along great and show no aggression with the baby chicks. But every experience is different, so introduce the new chicks carefully when they are several weeks old. (And do it in the evening when everyone's resting.) Then, keep an eye on the flock for a few days. There's nothing quite like watching a mother hen take her babies out to forage or seeing a chick's little head poking out from between her wings. 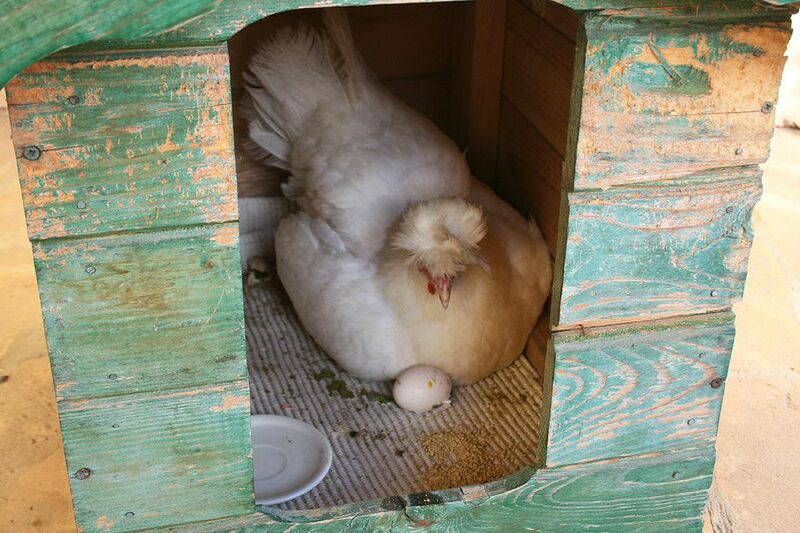 Watch you hen's motherly instincts as she allows the chicks to walk on her, while she sits patiently, or when she runs back to the flock—fluffed up and clucking—when she hears the babies chirp in alarm. Being a chicken farmer is all about marveling over these very social creatures. So enjoy the process, and then share the bounty when the new chicks mature into egg-laying hens.